Sorry, there are no shows on sale at Lyceum Theatre right now. The Lyceum Theatre is a 2,000-seat West End theatre located in the City of Westminster, on Wellington Street, just off the Strand. There has been a theatre with this name in the locality since 1765, and the present site opened on 14 July 1834 to a design by Samuel Beazley. The building was unique in that it had a balcony overhanging the dress circle. It was built by the partnership of Peto & Grissell. The present building retains Beazley's facade and grand portico, but the theatre behind is substantially different from the 1904 design of Bertie Crewe, restored to theatrical use in 1996 by Holohan Architects, after a long period of use as a Mecca Ballroom. The most recent shows at the theatre have been Jesus Christ Superstar, Oklahoma! and The Lion King. 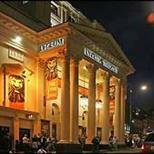 The Lyceum Theatre is located between Covent Garden (served by the Piccadilly Line) and Charing Cross (served by the Northern and Bakerloo lines) tube stations. The nearest train station is Charing Cross. Bus numbers 6, 11, 13, and 15. The closest car park is NCP Parker Street, off Drury Lane. The theatre's main entrance is up three steps to the lower foyer. From here there are 7 steps down to the Stalls and 12 steps up to the Royal Circle landing. The Grand Circle is up 83 steps. The venue has wheelchair spaces and transfers are available too. Please call 0844 871 3006 to book. The wheelchair accessible entrance is via a double EXIT door situated at the front of the theatre on Wellington Street, to the left of the five main doors. This is clearly marked and provides level access to the Accessible Toilets and the Stalls seating area. Upon arrival, please notify the Doorman who will open the doors for you. From the accessible entrance, a gentle slope leads past the Accessible Toilets to the Stalls seating area and the Stalls Bar, which is fully accessible. There is a Infa-red loop system for the hard of hearing. There is also a induction loop in the box office. Guide dogs are allowed into the auditorium by prior arrangement with the Box Office. Alternatively, the staff can dog-sit throughout the performance. For special requirements and information please call 0844 871 3006 or email Lyceumboxoffice@theambassadors.com.